Wahj: what have you been up to? True dat, but I think after a week of giving in to procrastination, I finally have text on the page that I'm reasonably proud of. However, there are also lots of stories from my seven weeks of travelling that won't make it to Lonely Planet. I mean, it's a guidebook, not a travelogue or a memoir. So since I've been getting storyteller's block when I'm with family and friends, plus there are more stories than can be told in one sitting anyway, I thought maybe I could try blogging some of them as I'm writing about the respective places. When people ask me what my favourite place on the trip was, I usually hesitate to give a reply because they were all good in their own way (except for Vinh, but more about that in a couple of days). Philosophically I also don't see much point in trying to single out one travel destination or experience and elevating it as the superlative. It smacks of a certain consumerist approach to travel that I'm none too crazy about. 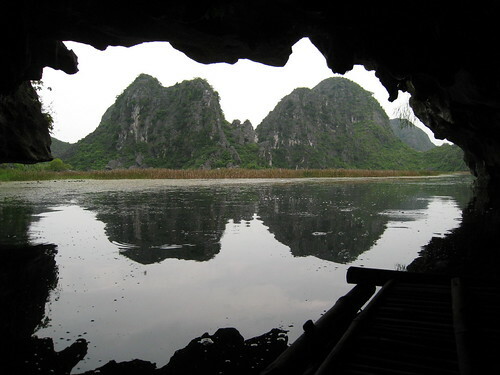 The blithe answer to the "favourite place" question, though, is Ninh Binh. Ninh Binh was easy to love. The weather was positively glorious for the three days we were there. The flowers were blooming and the buffalo were amiable. The rice fields were a ripe, rich green, and the farms were buzzing with harvesting activities (including a memorable skedaddle on motorbike past a small roadside fire fuelled by dried rice plants; I made it unscathed but my friend was unfortunately singed by a stray ember). And our motorcycle guides made things easy. The lead guide always spoke pretty good English, everyone drove safely, and all they had to do was whip us off the main path and down some country lane for me to be happy. In the living quarters of a 14th-century temple, we sat down for tea, bananas and persimmons with an elderly nun who wouldn't let Deanna take pictures of her until she put on her official robes. On an empty river coming back from Kenh Ga village, the boatman let me take the wheel because, you know, that's what they let tourists do. Deanna led forth to breakfasts of pho ngan (duck pho in a heady broth, which I never saw again on the trip) and other market foods that I promptly forgot the names of. When you spend most of your day looking at mountains (okay, limestone karsts) and blue skies, it's not hard to like a place. There were other mountains and other blue skies over the next seven weeks, but it was Ninh Binh's that I saw first.